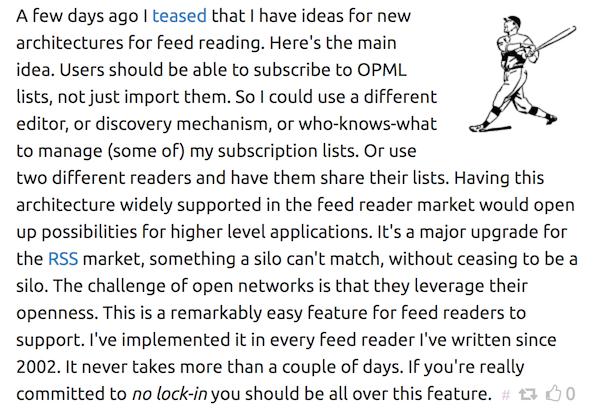 A proposal to developers of feed readers and podcatchers, to create a more powerful open ecosystem. Here's a screen shot of the post. If there was a one-click-link way to subscribe to feeds, that would be awesome. IMHO this more than anything has kept RSS from taking off. Auto-discovery was/is good but not universal and URL-copy-and-paste was always crappy. Reminds me of Mog, an old music aggregation system. It provided a tool to create a playlist from pages containing links to, eg, .mp3 files (intended for freely-released soundfiles), and a way to follow another user's playlists. This last feature meant that, once you found someone who had similar taste to yours and spent hours on the net curating playlists, you could find new music just by asking what they'd been listening to. Much better way to navigate the space than the "this is like what you listened to before", or "this is what got released this week". 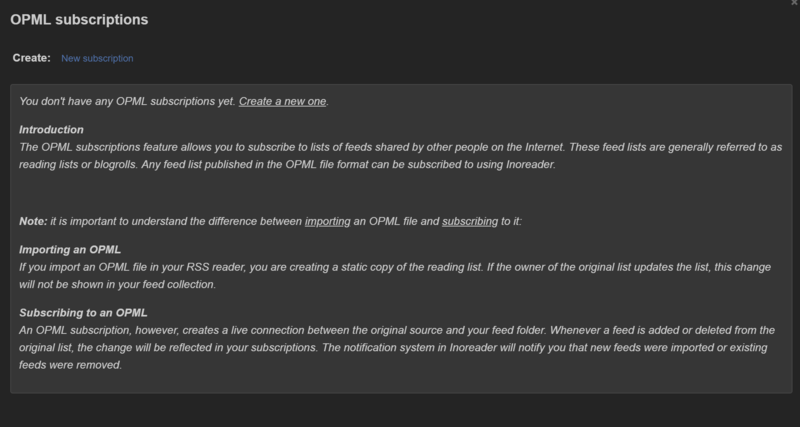 I like this a lot, and see how this improves life once I've subscribed to your OPML in my compatible feed reader-- but establishing that subscription still seems to require the same-old copying-and-pasting-urls-to-XML-files, right? Or am I just missing something? One step at a time. If that becomes burdensome, there are ways to make it easier, the trick is to get people to work together for the good of the market. It's rarely happened in this space. So the victory would be taking the first step. On Tue, Mar 26, 2019 at 10:11 AM Ross M Karchner ***@***. ***> wrote: I like this a lot, and see how this improves life once I've subscribed to your OPML in my compatible feed reader-- but establishing that subscription still seems to require the same-old copying-and-pasting-urls-to-XML-files, right? Or am I just missing something? — You are receiving this because you authored the thread. Reply to this email directly, view it on GitHub <#113 (comment)>, or mute the thread <https://github.com/notifications/unsubscribe-auth/ABm9O7pPAtMssrkfTZC3BFATTNJtzsOZks5vaiqigaJpZM4cHH6h> . I am intrigued by the idea but I don't have clear the difference between importing OPML and subscribing to OPML. Services could enhance this by shipping browser extensions. Feed readers for macOS/iOS could include an extension that simplifies this. That would be an alternative/complement to supporting feed://-like URLs. @funkyboy My understanding of subscribing to an OPML file is that it's sort of like an import, except if the maintainer removes or adds a feed or updates its URL, that feed is removed or added updated as you see it in your reader. You'd be subscribing to a curated list of feeds, not a one-time import. A reading list, as it were. A fictional example: Say you were an expert in birdwatching, and you maintained an evolving list of birdwatching blogs and other news feeds, but instead of it being a list on a sidebar (what we at one time called a blogroll), it'd be an OPML file, and people could just subscribe to that and get all the feeds. Maybe some bloggers stop talking about birdwatching, or a new birdwatching blog emerges. You as the maintainer of the birdwatching OPML file would do the subscribing and unsubscribing, and those interested in birdwatching could subscribe to one feed and rely on you to maintain their list for them. A one-time import would get stale after a while. A maintained OPML file would be fresh, assuming the maintainer keeps it up to date and hands it off to someone else when they move on. @sillygwailo -- that's exactly right. Then how you’d implement states like “read” or “bookmarked” for entries? @funkyboy Same way RSS readers do now, however that is. Individual feeds would just be individual feeds. No change there. @sillygwailo The main decision to make when implementing this is around whether or not you will remove feeds from the aggregator when the OPML file(s) you're following removes them. There's a line where following somebody else's interests becomes them literally controlling your news river if deletion is supported. @daveajones -- maybe we've had this discussion before, it sounds familiar. It's not a problem. Keep a reference count for each feed. Only stop reading it when the refcount goes down to zero. So if you subscribe to my feed on your own, and it also happens to be in a reading list, if it disappeared from the reading list, your aggregator wouldn't unsub because it would have a refcount of 1. This is well-understood tech, many garbage collection systems use this technique to know if a block of memory can be released. When the count goes to zero, no one cares, so you can deallocate it, the equvialent of unsubbing.